Casa del Canal is a fabulous Canalfront Home. Serenity Now is direct Bayfront with a Private Dock! The Reel Deal is Canalfront & adorable! Waterfront Aqua Vista has amazing Water Views! 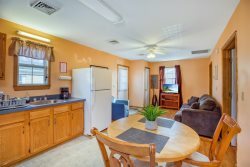 Captain's Cove is a wonderful water privileged community nestled on the shores of Chincoteague Bay. Featuring a championship nine hole golf course, three swimming pools, fitness center, boat ramp & transient slips, full service dining and much more, every member of the family will find something to do here. Captains Cove is a short 20 minutes from Chincoteague and 40 minutes to Ocean City, MD. There is so much to explore here...you will be back! Serenity Now: A Stunning Waterfront Retreat in Captain's Cove - Just minutes from Chincoteague Island! The Reel Deal - A delightful Waterfront Victorian in Captain's Cove! Calypso - Waterfront Living & Incredible Amenities are waiting for YOU!